Among the wave of press conferences and breaking news items at Daytona last weekend, this one was a little overlooked. We couldn’t announce it beforehand, but can do a proper job now, although the team launch isn't happening officially until the Miami Homestead race. Peter Law and Frank Howard are the men behind the project – to run two of the Crawford-built ‘Prep 2’ cars in the Rolex Series GT Class. The target is to debut the cars at Homestead in March. Johnny Mowlem, Bryan Sellers and Ian James are definitely on the driver strength, with a fourth top class driver set to be anounced shortly. Andy Scriven, Max Crawford’s chief designer, has come up with the chassis – almost a DP tubeframe, with the engine at the front. 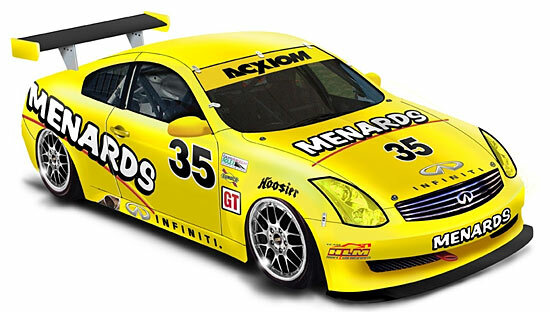 Engine power comes from 4.5 Infiniti V8s, prepared by Menards Engineering – effectively a DP engine. All ready for 2007? “The team does have plans to head towards the Daytona Prototype class by the end of this season,” said Johnny Mowlem. “But more importantly for now is to concentrate on the G35s. Frank Howard and Peter Law (Darren’s father) have set up the team with a very clear plan for the future, and they’ve already developed a close relationship with the Infiniti brand in North America. Mowlem raced the SAMAX Porsche in the Rolex 24, this car setting the third fastest lap in the class, in his hands, so he obviously knows a little about what the competition will be. "The SAMAX team worked very hard the whole race, and we were a little unlucky not to finish higher up. We showed we had the speed to win, but unfortunately that's only 50% of what it takes to win an endurance race! The Daytona circuit suited the Porsches over the Pontiac, but the handling of the Pontiac, in particular under braking, was exceptional, and that is going to make them a real threat on circuits where handling is more of a premium."